Borror Properties is going before the Victorian Village Commission Thursday with revised plans for its eight-story, White Castle-anchored complex in the Short North. 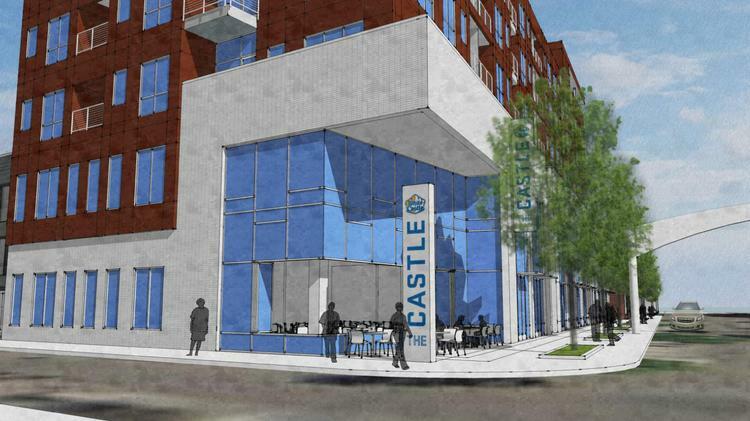 The size of the planned mixed-use development at 965 N. High St., the site of an existing White Castle restaurant, remains unchanged at 98 apartments and 206 parking spots, with 11,000 square feet of street-level retail and 12,000 square feet of second-floor offices. Notes on the redesign, I significantly think it is better. Fiber cement panels? That should be a giant red flag to the commission. Borror needs to use a high-quality exterior material that will last. Other than that, the new design is pretty uninspiring but fine IMO. What other retail tenants would people want to see here? I wouldn’t mind a 24 hr CVS or Walgreens type place. Borror needs to use a high-quality exterior material that will last. you’re aware of their work in the burbs, right? Yes, I am. And to date I’ve been pleased with the commissions holding them to a higher standard on most of their projects down here in the city. Hoping that continues with this proposal as well. Might as well just make it red brick. No fiber cement panels. It is gonna look cheapo otherwise. The design is meh. If those are fiber cement panels, swap them out for brick and I’d be okay with it. That is one massive building! Bah, disagree. That design looks like it belongs in SpongeBob. The new one is better in my opinion, but I think the fiber cement panels are a huge disappointment. I was looking through the VVC’s meeting notes and the commissioners seemed split on the topic. But for it to have been included at all in the tiny blurbs they put in those meeting notes it must have been a hot topic. I didn’t like the original (above) design. Always felt too gimmicky and a bit like an unfinished design. I like the original colors better than the current red. Even old building lovers like me get tired of developers using red brick because that is what they think makes it fit in well with surrounding older structures. That heavy white (or light grey) band above the first floor is visually abrupt with the red cement board on the upper floors. Looks a bit like they are sticking an old building in the top of a new one. New builds are supposed to be a product of their own time yet sympathetic to the surrounding historic structures. This is neither. The Business First article states that they hope to start construction in the summer. With the economy becoming unstable and an apartment glut looming, I am not sure if this or many other PROPOSED projects will materialize.